ZACHARAKI's double studios are dual aspect and accommodate 2 people. Each room has a separate entrance. Their furnishings follow the traditional - classic style and are distinguished for the intimate atmosphere they exude. They have a double or twin beds and a sofa bed. All have an equipped kitchen with electrical appliances and household utensils and dining area. They have a bathroom with a shower and a hairdryer. 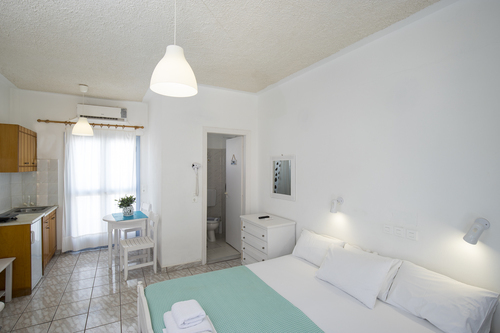 The ground floor rooms have a private terrace in our paved courtyard, while the 1st floor rooms have a private balcony with sea or mountain views to ancient Thira. The ZACHARAKI complex has triple studios with autonomous entrance that are dual aspect and accommodate 3 people. They stand out for the traditional - classic style of their furnishings that creates an intimate ambience. They have a double bed, a single bed and a sofa bed. They have an equipped kitchen with electrical appliances, household utensils and a dining area. They have a bathroom with a shower and a hairdryer. 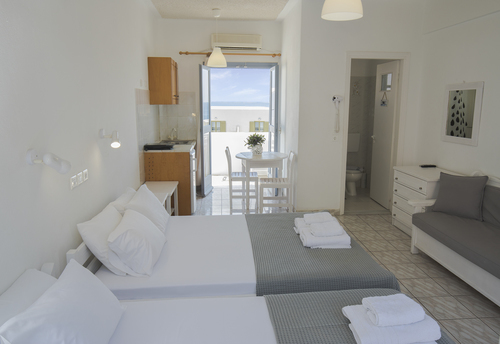 The ground floor rooms have a private veranda with dining table in our paved courtyard, while the 1st floor rooms have a private balcony with sea or mountain views to ancient Thira.